Forensic science is in crisis and at a cross-roads. Movies and television dramas depict forensic heroes with high-tech tools and dazzling intellects who—inside an hour, notwithstanding commercials—piece together past-event puzzles from crime scenes and autopsies. Likewise, Sherlock Holmes—the iconic fictional detective, and the invention of forensic doctor Sir Arthur Conan Doyle—is held up as a paragon of forensic and scientific inspiration—does not "reason forward" as most people do, but "reasons backwards." Put more plainly, rather than learning the train of events and seeing whether the resultant clues match those events, Holmes determines what happened in the past by looking at the clues. Impressive and infallible as this technique appears to be—it must be recognized that infallibility lies only in works of fiction. Reasoning backward does not work in real life: reality is far less tidy. In courtrooms everywhere, innocent people pay the price of life imitating art, of science following detective fiction. In particular, this book looks at the long and disastrous shadow cast by that icon of deductive reasoning, Sherlock Holmes. In The Sherlock Effect, author Dr. Thomas W. Young shows why this Sherlock-Holmes-style reasoning does not work and, furthermore, how it can—and has led—to wrongful convictions. 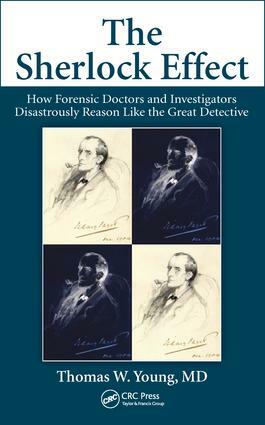 Dr. Alan Moritz, one of the early pioneers of forensic pathology in the United States, warned his colleagues in the 1950’s about making the Sherlock Holmes error. Little did Moritz realize how widespread the problem would eventually become, involving physicians in all other specialties of medicine and not just forensic pathologists. Dr. Young traces back how this situation evolved, looking back over the history of forensic medicine, revealing the chilling degree to which forensic experts fail us every day. While Dr. Young did not want to be the one to write this book, he has felt compelled in the interest of science and truth. This book is measured, well-reasoned, accessible, insightful, and—above all—compelling. As such, it is a must-read treatise for forensic doctors, forensic practitioners and students, judges, lawyers adjudicating cases in court, and anyone with an interest in forensic science. Dr. Thomas W. Young, a forensic pathologist and full-time forensic doctor for nearly thirty years, has testified in court over 460 times both as a prosecution and defense expert. He is a fellow of the American Academy of Forensic Sciences and the National Association of Medical Examiners: two organizations that represent the mainstream of forensic science and pathology. He has written extensively and been published peer-reviewed journals. He served as a chief medical examiner successfully for nearly 12 years and is a former director of a training program in forensic pathology. As a forensic practitioner, what makes him uniquely qualified to write this book are not only his credentials, his research on real-world trials and case studies, his examination of current practices, and his close study of deductive and inductive logic. Thanks to his years as a chief medical examiner and as a current independent forensic pathology consultant, Dr. Young has a deep understanding of the problem about which he writes.